Your body requires a balanced diet for proper function. This includes proteins, carbohydrates, vitamins, fats, and minerals. Proteins are essential in the body for proper brain function, tissue repair and regeneration, metabolism and boosting the body immunity among others. Protein is a component of body cells and is a component of a healthy diet. Protein supplements offer a convenient way to help meet your protein intake requirements. Most people can obtain their daily dietary requirements of protein easily. However, if a situation where greater protein intake is necessary, you may need to supplement your intake. 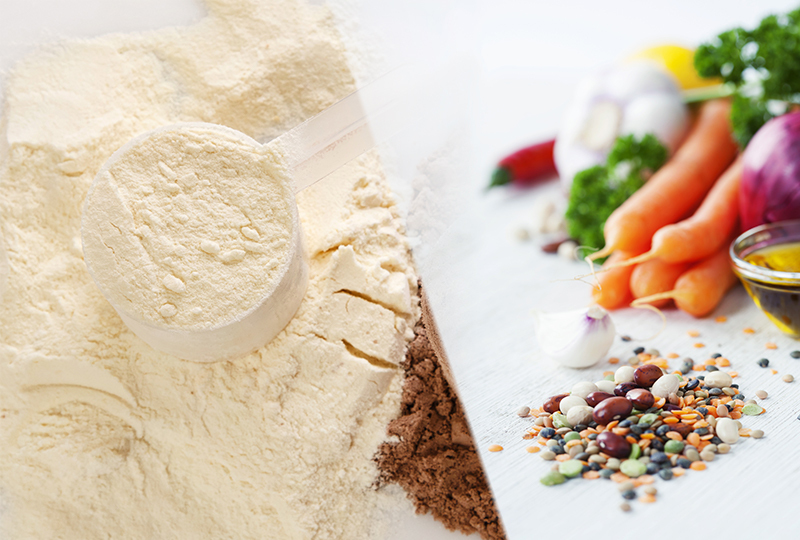 There are two common varieties of protein supplements; plant and animal based. Favorite sources of plant proteins include peas, rice, hemp, and soy. On the other hand, whey is an animal based protein supplement. It is a highly processed derivative of milk. Whey supplements have been around for a long time while plant protein supplements are only gaining popularity in comparison. There are distinguishing factors you should be aware of between the two. Let’s look at some of them. Effectiveness: They are just as good as whey protein supplements in getting the job done. Digestion and metabolism: They are digested better than the dairy-based whey. Healthier: Plant proteins are not processed. They do not contain artificial additives, preservatives or flavoring components. They are an exceptional source of amino acids, fiber, antioxidants and more. Taste: They are mostly considered to be better in taste and easier to mix with water. Variety: There is more choice in the food components in plant-based proteins. However, some plant protein products contain lower amounts of specific amino acids. This is of little concern as your body will get sufficient nutrients from the combination of both your regular diet and the supplement. Alternately, you can opt for products that have the complete range of ingredients. You will find it at your favorite local or online store. Whey is effective for muscle growth and repair. Additionally, it is packed with digestive enzymes and other nutritional enhancements. Convenience. It comes in an easy to ingest format such as a shake, which is quickly absorbed into the body. c) Most people with dairy-related allergies find it difficult to hold them down and properly digest them, not to mention elevated levels of stomach gas. Both plant and whey protein supplements deliver proven results. Plant protein supplements offer healthier, easily digestible organic blends of two or more ingredients to achieve desired results. Whey protein supplements are affordable, convenient and have been trusted for years. Accordingly, take your pick based on individual preferences and health benefits. Join our mailing list and have the latest blog posts delivered to your inbox. You have successfully subscribed to our blog. We will not rent or sell your personal information. Can Movement Patterns Really Be Standardized?